Is it possible to grow cereal crops without having to rely on energy-requiring commercial fertilizers? In a new study publishing August 7 in the open-access journal PLOS Biology, researchers describe a newly identified corn variety which acquires nitrogen—an essential nutrient for plants—by feeding its sugars to beneficial bacteria, which can in turn take up nitrogen from the air and pass it back to the plant in a usable form. The variety of corn was initially observed in the 1980s by Howard-Yana Shapiro, now Chief Agricultural Officer at Mars, Incorporated, in a nitrogen-poor field near Oaxaca, Mexico. 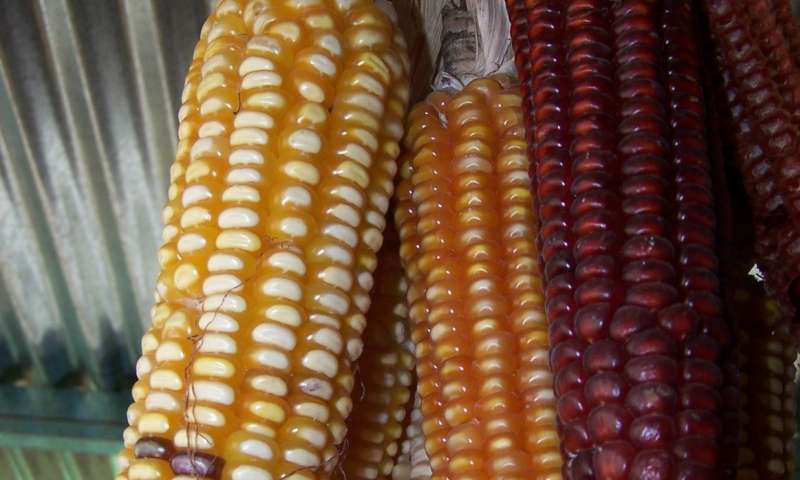 With the emergence of metagenomics in the mid-2000s, Mars, Incorporated and the University of California, Davis, partnered with the local indigenous community to investigate the corn. The research team was led by Alan Bennett and Allen van Deynze at UC Davis. The study describes the unusual corn variety, which obtains 29 to 82 percent of its nitrogen from the air, rather than through fertilizers. The plant produces a sugary 'goo' that oozes from aerial roots that grow from above the ground, and which attracts bacteria that can transform nitrogen from the air into a form that the plant can use. If this trait could be bred into conventional varieties of corn, it may reduce the need for added fertilizer and increase corn production in regions with poor soils. Beans and other legumes have established beneficial relationships with communities of bacteria that provide them with nitrogen, but corn and other cereal crops traditionally lack these relationships. The commercial fertilizers required to grow corn come from fossil fuels, and their energy-intensive production uses an estimated 1 to 2 percent of the global energy supply. Scientists have been eager to devise a way for corn to take advantage of these nitrogen-producing communities. Prof. Bennett and his colleagues are interested to see whether other cereals, such as sorghum, can also use their aerial roots for a similar function. "The idea that isolated local varieties of maize might associate with nitrogen-fixing bacteria is not new, but it has been difficult to identify such a variety and demonstrate that this nitrogen-fixing association actually contributes to nitrogen nutrition of the plant," says Prof. Bennett. "Our interdisciplinary research team has been working on this for nearly a decade."